11239 ft (3426 m) Highest point in Oregon . Mount Hood is the highest peak in Oregon and one of the most frequently climbed glaciated mountains in the world. 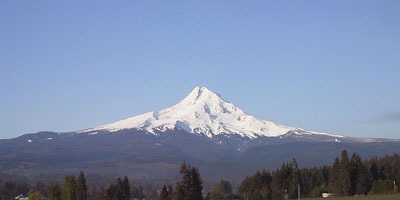 Its sharp cone dominates the skyline only 45 miles (70 km) east of Portland, and a dozen glaciers keep the peak permanently snowbound. Two major ski areas are found on the south side, and the lifts at Timberline run year-round on the Palmer Glacier (snowfield), fed by nearly 500 inches (12 m) of annual snowfall. 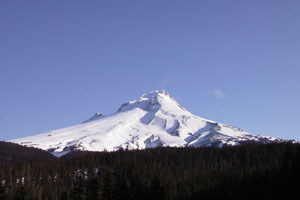 Hood is skiable directly from the true summit by several routes, although all of them are quite steep and somewhat exposed. Below the summit area, the slopes moderate greatly and there are numerous excellent possibilities for safe and uncrevassed ski runs. (13 km) The standard South Side route follows the Palmer Glacier above the highest lifts, allowing one to cheat and use the lifts in order to make a quick ascent. The upper portion of the ski descent from the summit used to be considered quite extreme, but recent ablation of the glacier has reduced the risk somewhat, although the large bergschrund (crevasse) is still hazardous in spring. This 45-50 degree pitch drops directly from the highest point into the steaming and sulfurous remains of Hood's crater, and then moderates in slope below the crater as it returns to the top of the lifts. Full page description and photos of South Side routes.